Do you want a challenging job in development or research? Are you planning a career as a consultant or manager? Either way, do you see your future in a large, well-known corporation? As a graduate of the Master’s program in Mathematics, you will not have to write countless applications to get your dream job. Whether software development, consultancy, data security, medical science, communication, or IT: mathematicians are highly sought after in almost all branches and areas of the labor market. This is because they analyze many everyday problems from an abstract perspective, find creative solutions, optimize processes and come up with reliable prognoses. In the Master’s program in Mathematics, students deal with mathematics as a precise science. Numerous opportunities to acquire advanced knowledge are available to them, concerning areas such as Algorithmic Algebra, Analysis, Dynamical Systems, Geometry and Visualization, Mathematical Model Building, Bio Mathematics or Mathematical Physics. In contrast to all other mathematical Master’s programs at the Technical University of Munich, students do not have to complete a minor. However, they can incorporate lectures from one or more minors into their studies. During extra-disciplinary courses, students acquire soft skills in areas such as rhetoric and presentation, which are indispensable for their future careers. The Master’s program in Mathematics at the TUM is full time. The standard duration of study is four semesters. Students can commence the Master's program in Mathematics in either the winter or summer semester. The entire Master’s program in Mathematics can be pursued in English. Certain teaching sessions will be held in German. Students can attend selected lectures from minor subjects such as Informatics, Physics, Chemistry, or Economics as well as, upon submitting a special application, further disciplines. However, they can also fulfill all ECTS requirements in Mathematics alone. The Advanced Seminar is one of the compulsory requirements. Please note when selecting a seminar that permission to commence the thesis is in some departments dependent upon you having successfully completed the Advanced Seminar. There are numerous opportunities to specialize: Algorithmic Algebra, Analysis, Dynamical Systems, Geometry and Visualization, Mathematical Model Building, Bio Science as well as Mathematical Physics. Details of all the modules that are relevant to the degree program, along with associated times and locations, are available in the curriculum at TUMonline. Here you can create your own timetable and save it digitally. The area in which you acquire advanced knowledge during the degree program informs your choice of topic for your Master's thesis. Read everything you need to know about the Master’s thesis here. You can round up your individual personal competence profile through modules out of the field of extradisciplinary competencies. Lead by your own interests you can choose out of a large offer of soft skills or language courses. During your Master's program, you can already spend one or two semesters abroad at one of TUM's partner universities. Important: Inform yourself in good time. The recognition of modules completed abroad is possible. The prerequisite for the TUM Master's program "Mathematics" is an accredited university degree in Mathematics, Physics, or a comparable course of study. 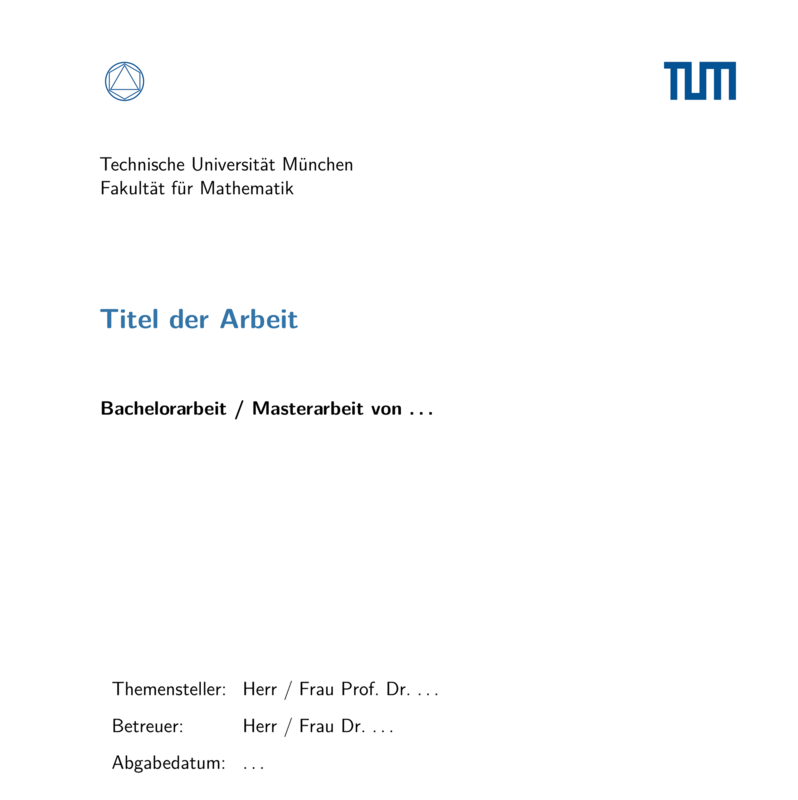 If you are interested in the Master's program you should refer to the "Basics of the Bachelor's degree course in Mathematics at the TUM" (see check list) to verify the required competencies in detail. You need to have acquired at least 29 ECTS credits from among the lectures listed in Table A3.1. If these conditions have been missed by only a narrow margin, you´ll have points deducted during the application process. If the commission thinks that there is too much missing content, your application will be rejected. Please note: The examination regulations for the master’s program in Mathematics will soon be changed. A PDF of the new regulations will be made available shortly. While there are no relevant changes in the application process, the new regulations will be in effect for every applicant beginning his/her studies from the summer term of 2019. For all interested students at TUM there will be an information meeting in January 2019, the date will be communicated by email.